"Much better than the standard pound cake, I got the recipe from a great-aunt, over 40 years ago." Preheat oven to 375 degrees F (190 degrees C). Grease and flour a 8x4 inch loaf pan. In a large bowl, cream butter and sugar until light and fluffy. Add sour cream and eggs. Add flour and pinch of soda, mix well. Pour into a 8x4 inch loaf pan. Bake at 375 degrees F (190 degrees C) for 1 hour, or until a toothpick inserted into center of cake comes out clean. I added lemon zest and poppy seed to this recipe. Zest of one lemon, juice of lemon and 1/4 cup poppy seeds. Then I added a lemon glaze of lemon juice, powdered sugar and milk. 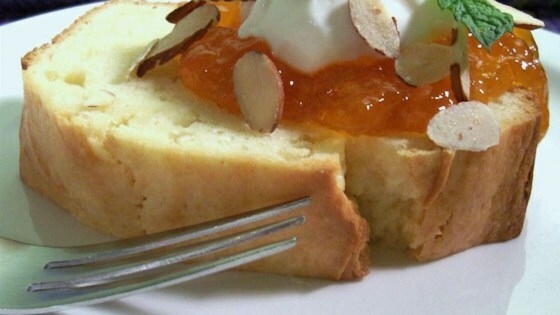 Excellent pound cake - very moist and goes perfect with fresh strawberries and homemade whipped cream. I did add 2 tsp. of vanilla extract and 1/4 tsp. of lemon extract.